We offer large format printing on various stock, including paper, label and vinyl. Can be mounted on several materials, grommeted for hanging and/or laminated for extra durability. Prices begin at $7.00 per square foot for paper and $10.00 per square foot for vinyl. 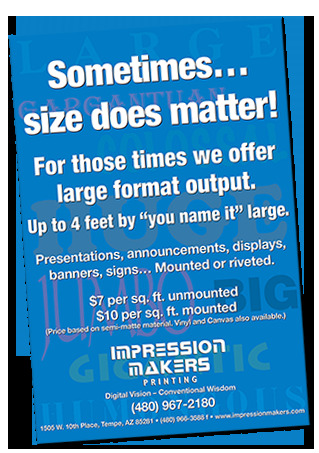 Mounting, laminating and grommeting are an additional charge.